Let’s start with a simple one. Ever want to get a random item out of an array? You might use rand or mt_rand to get a random number, passing 0 and the last index of the array as the min and max parameters; this will give you a random key that you can use to pull a value from your array. However, there’s a way that’s a little bit quicker: array_rand. Just pass it your array, and it will return the random key. If you want more than one random value from the array, pass a second parameter identifying how many; you’ll get back an array of random keys. cPanel is the leader and industry standard of standalone hosting platform nowadays. The main product WHM/cPanel has been used by most web-hosting providers due to its flexibility, and because it’s easy to manage,customizable and backed by great quality support. Most of us who are involved in the web-hosting industry have heard of what it can do.If you are new to cPanel however, there are a few things that we would recommend that you do during the intial phase. Listed after the jump are 5 recommended initial setups for new cPanel users. Often when I complete a keyword research project for a client, they ask me about keywords I may not have included, or they want to know what the relative competition on the keywords looks like. This happens often enough that I thought I would remind everyone that while research for SEO and PPC can go hand in hand, they’re actually very different. First, think about what your goals are with each medium. What are you trying to do, and what constitutes success in that area? Next, think about how the keywords will be used. Where, when, how often? Finally, consider what your margin for error is. If you don’t get exactly the right keyword, what’s the penalty? Whether you are looking to increase your conversion rate on your Google Adwords campaign, or grow the amount of inbound inquiries to your site, landing page design is key. The page that users are sent to following a click of an advertisement or from a search engine page result much be simple, to-the-point, and carve a clear path for customers to follow. If not, users will leave quickly, your bounce rate will increase, and your advertising dollars will be wasted. We recently showed you just how badly some of Apple’s retail elite behave when no one’s watching, but surely they were taught better, right? You bet they were: Apple tells its new recruits exactly what what to think and say. How do we know? 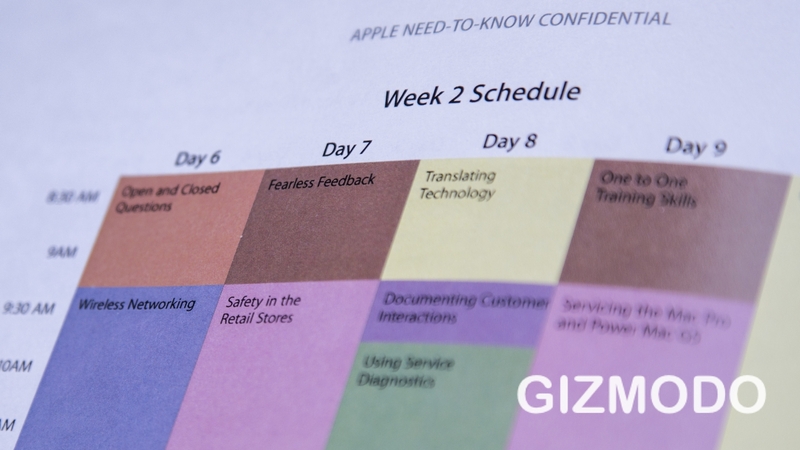 We read Apple’s secret Genius Training Manual from cover to cover. It’s a penetrating look inside Apple: psychological mastery, banned words, role-playing—you’ve never seen anything like it. The Genius Training Student Workbook we received is the company’s most up to date, we’re told, and runs a bizarre gamut of Apple Dos and Don’t, down to specific words you’re not allowed to use, and lessons on how to identify and capitalize on human emotions. The manual could easily serve as the Humanity 101 textbook for a robot university, but at Apple, it’s an exhaustive manual to understanding customers and making them happy. Sales, it turns out, take a backseat to good vibes—almost the entire volume is dedicated to empathizing, consoling, cheering up, and correcting various Genius Bar confrontations. The assumption, it’d seem, is that a happy customer is a customer who will buy things. And no matter how much the Apple Store comes off as some kind of smiling like minded computer commune, it’s still a store above all—just one that puts an enormous amount of effort behind getting inside your head. We all know that backlinking is essential for SEO success. I outlined this in my article about off page SEO. However, there are still a couple of backlinking mistakes committed by people worldwide which is costing them dearly in search engine rankings, traffic and most importantly, revenue. This follows on from the previous back-linking mistake. It also emphasizes the importance of choosing to target 1 keyword per page. For example, if you have a webpage which is optimized for the keyword “designer wedding shoes” then all the back-links with the keyword in the anchor text should be sent to that page. Don’t send it to your home page or any other page. Sounds simple and logical, but so many people forget about this. HTML5 and CSS3 are playing a prominent role in the field of web design. Web developers and designer consider the CSS3 and HTML5 as the first option when designing a web site due to its additional functionality and great features. It let them to create some really stylish and trendy website. So in order to help them, today we have some creatively designed HTML5 and the CSS3 templates and layouts in order to give a professional look to your website. PHP can be a beautiful thing and that is definitely the case with these awesome tutorials. In this roundup, you will find The Best PHP tutorials on the web today. Click through, learn something. Enjoy!